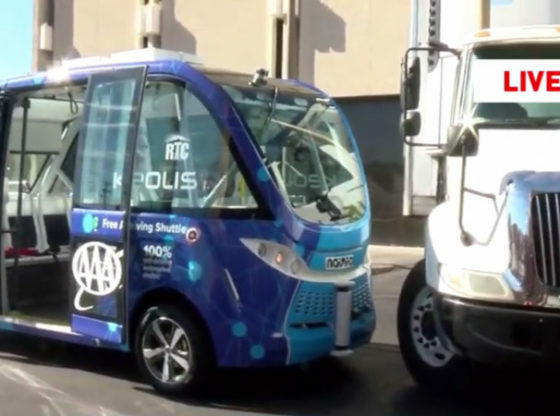 Las Vegas authorities have tested the bus driven 100% by autopilot in real traffic and it managed to crash on its very first day. The automated shuttle was first tested in Las Vegas. Unfortunately, after only 2 hours of running in Las Vegas traffic, the bus was involved in a road accident. While being tested, the bus was hit by a truck. However, according to interview, the autonomous system of the bus has performed perfectly. It seems that the accident occurred after the automatic pilot decided to stop the bus, its sensors anticipating the risk of the impact with a truck. But after the bus stopped, it was hit by the truck, mainly because the truck’s driver was unable to stop in time. Fortunately, no one was injured in this accident, and the authorities state that the unmanned bus acted exactly as it should. Also, from this interview, it is unclear if the accident could have been avoided if the bus backed up in order to allow the truck to pass. The autonomous bus can carry up to 12 people, all of them wearing seat belts. As soon as it is repaired, the bus will be tested continuously in traffic for the following 12 months. The autonomous bus does not have a steering wheel or brakes, since it is driven by a computer.